It’s not just the fruit of the orange that tastes lovely with chocolate. The peel pairs nicely as well. Granted, there is a bit more preparation involved with this particular coupling, but it is well worth the effort. All you have to do is blanch the peel. Personally, I never knew one could blanch fruit, I thought it was a practice only relegated to vegetables. Which probably explains why I have never actually blanched anything. That is, until now. First, you need to get yourself some orange peel. How do you do this? Pretty easy really. Eat an orange. I know, crazy. Actually, invite some friends and make it three or four oranges. I bet you have some peel left over don’t you. The only other ingredients needed are water, sugar and chocolate. No breaking the bank here. Once you have your peels, wash them and slice into long strips. You can cut out most of the pith (the white part of the peel) but leave a little on. This is the part that comes in handy in telling you when the candied part of your peel is done. Next, bring a pot of cold water to a boil. Once the water is boiling, throw the peels in for two minutes. 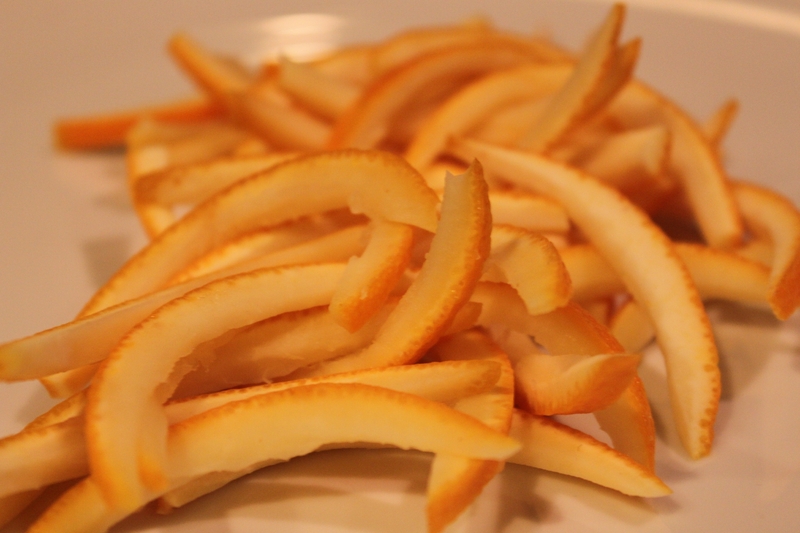 After two minutes, remove the peels and place them in a bowl of ice water. Repeat this step two more times. That includes bringing a pot of cold water to a boil. I know, seems silly but I had to throw out my first batch of candied orange peel when I strayed a little from this. Turns out, you really do need to follow directions. You have now successfully blanched. Do you feel all different and grown up? I did. And now you can be all, “yeah, I blanched some orange peel the other day” the next time you talk to your foodie friends. Awesome. Now get off your high horse and get back to the recipe. Next up, mix one cup of water and three cups of sugar. Yes, that is right, three cups of sugar. Place this sweet concoction on the stove and heat until it registers 230 degrees on a candy thermometer. I did this so I will translate. Bring the mixture to a boil. Once you see the mixture bubbling, it is pretty much 230 degrees. 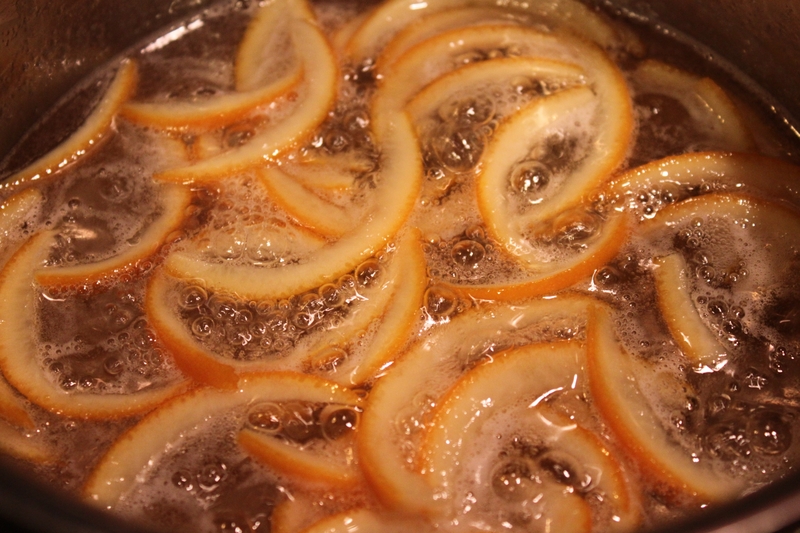 Now, place the peels into the bubbling sugar syrup and turn the heat down to a simmer. Simmer for at least 45 minutes, or until the peels appear translucent. Again, I will translate. Simmer for about 90 minutes. Once the peels are translucent, remove carefully and then roll in sugar. Allow to air dry. I would say anywhere from about an hour to when you just want to go to bed and really don’t want to leave the sugary peels out overnight like some recipes say to because you don’t want bugs. I know! So simple! The last step, melt some chocolate and dip the aforementioned sugary peels into it. Again, no fancy double boiler needed. Just take a bowl and fill with the chocolate you want to melt. Place the bowl on your coffee maker’s heating element. If you do not have a coffee maker, just bring a small pot of water to a boil and place your bowl on top. Now here is an important tip – the bowl needs to be larger than the pot. If you choose to not ignore this one particular tip, well, you will know exactly why I wrote that. 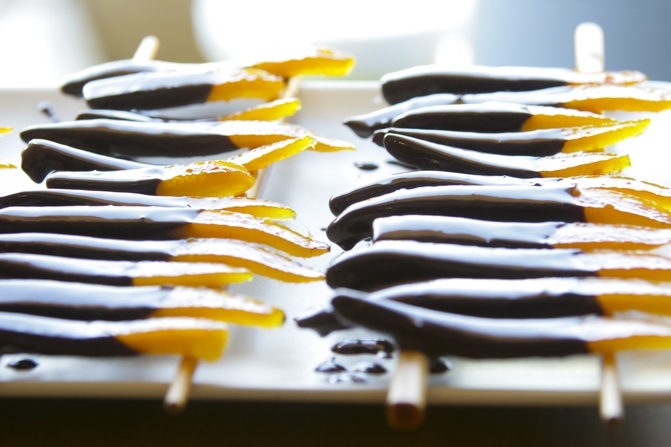 Once the chocolate covered, candied orange peels are cool, store in an airtight container. I am sure there is a specific amount of time the peels are good for. But I have yet to ever see anything dipped in chocolate go bad. Seriously, just saying. Important disclaimer: Unlike my previous post, clementines are not a good substitute for this. The skin of the clementine is more bitter than the average orange so on this recipe, the only ingredient that is acceptable to substitute out is the chocolate. And really, that is only the dark chocolate for the milk or white varieties. Vanilla orange shortbread, need I say more?